Sam Evian (a.k.a. Sam Owens) is sharing two new songs before his North American tour with Cass McCombs in March and his U.K. headline tour in August. “Cherry Tree” and “Roses” will be released by Saddle Creek as a limited edition 7” (250 copies) that is available for pre-order now. The 7” comes on the heels of Sam’s sophomore album, You, Forever, which came out in 2018. 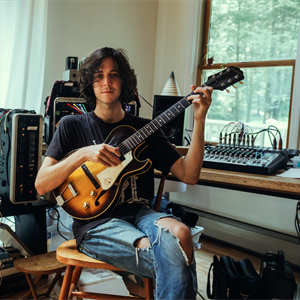 Both songs shine a light on the evolution of Sam Evian’s music. “Cherry Tree” is a daydream of the first warm hints of spring, which came to Sam as he took in the sun under a cherry tree in New York’s Central Park. It was also the first song that Sam Owens ever released as Sam Evian. The song has remained a fan favorite and a staple of his rousing live set. “Tell me life’s a passing cloud,” he urges amid a charming backdrop of lilting guitars, gorgeous piano flourishes, and a swelling harmony-vocal chorus. “Roses,” an unreleased song from the You, Forever sessions, offers a lyrically complex but equally reflective outlook as its 7” counterpart. “I’d like to travel freely and see the old roads that I’ve known…” Sam will get to do lots of driving in the next several months. New dates are announced today, including appearances at End of the Road Festival and Manchester Psych Fest, as well as UK headlining shows.